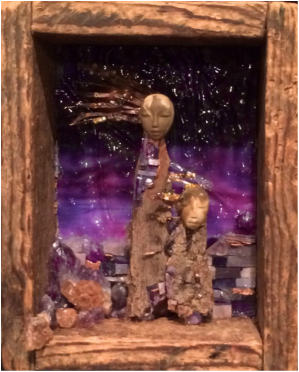 My collection of Spirit Women was inspired by the women of the Book of Genesis. They spoke to me of the beginning of time, of day and night, the earth and its bounty, of the human soul and our connection to the whole. These pieces were created using a variety of materials, including Italian and Mexican smalti, stained glass, tile, beads, various metals, clay, wood, and shell. This piece was inspired by the biblical prophetess Miriam. Stories tell us that as the Israelites crossed the Red Sea, Miriam stood at the opposite shore singing and dancing to motivate the people. It is also said, as they wandered the desert a well of water followed Miriam to quench their thirst. I was moved by her heroism and bravery. 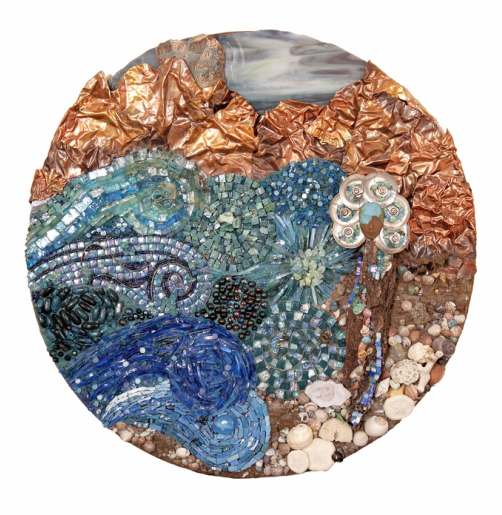 This piece was created using Italian and Mexican smalti, stained glass, tempered glass, glass tile, ceramic tile, beads, turquoise, various metals, clay, wood, and shell. 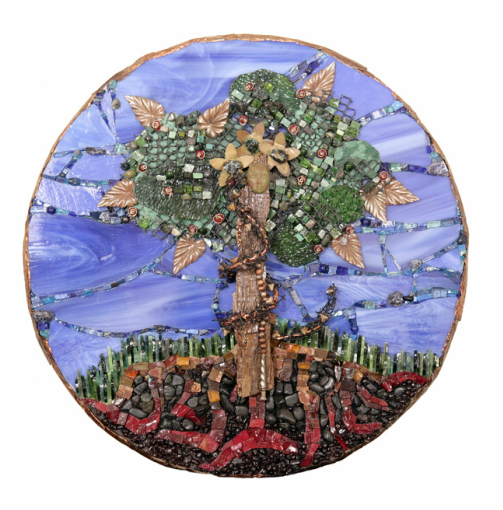 This unique piece was inspired by the Book of Genesis. There was those questions of desire, of passion, of the quest for knowledge that intrigued me. Here is the spirit of Eve with the snake slyly whispering his secrets in her ear. This piece was created using natural bark, clay, wire, Italian and Mexican smalti, stained glass, mesh netting, metals, jewelry, beads, pebbles, garnet, and edged in copper. 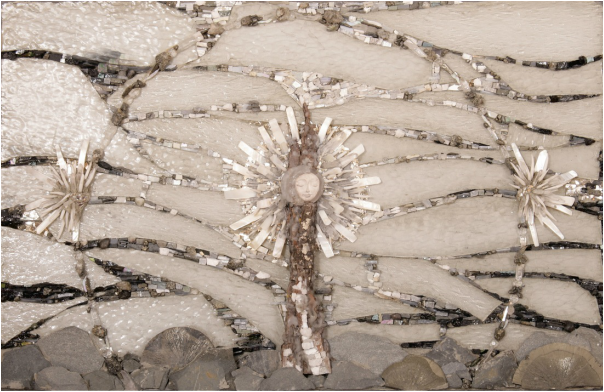 This one-of-a-kind piece was inspired by the story of the sightings of Mary in the caves of Lourdes, France. It is meant to bring a sense of healing and peace. 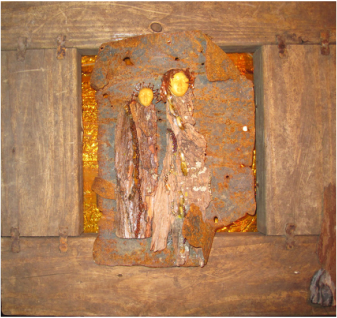 This work was created using reclaimed wood, clay, wax, marble, kyanite, quartz, crystal, stained glass, vintage copper and jewelry, smalti, and stains.